The revelation of the mysteries behind love. All the commandments of God are based on the foundation of love and the key to solving all the problems of the world lies in the perfect understanding about love. 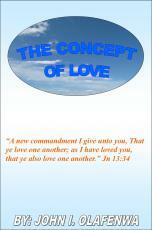 "The Concept of Love" provides comprehensive answers to all the questions being asked by youths and adults about the interpretation of love and how to express love. It also reveals in simple ways, how to apply love in solving all the problems we face daily as individuals, a society and the world as a whole. Many innocent souls are perishing worldwide due to ignorance about love, a larger percentage of the world's population are deeply rooted in sin due to inability to properly interprete the greatest commandment of God, which is love. It is time to free our world from darkness, ignorance and sin, and the only way we can drive out this darkness is by spreading the light of true love.